UW Transportation Services works with FP&M Physical Plant – Grounds to ensure sidewalks, bus shelters, parking lots, and roads are as clear as possible during the winter months. In order to help make our efforts successful, we ask you to assist us by adhering to the winter parking rules from November 15 until March 15. Encounter snowy, slippery, or icy conditions in campus parking lots? Let us know and we can direct a team (Grounds or otherwise) to address the issue. Snow removal requests for other areas can be directed to FP&M Physical Plant – Customer Service. Moped riders—has your lot not been plowed yet? Let us know and park in the nearest available “all access” lot. See the moped page and the moped parking map for details. These rules apply from 2 a.m. to 6 a.m. every day from November 15 through March 15, regardless of weather conditions. No parking on Observatory Drive or Linden Drive. This includes Lot 26 and 40. There is restricted parking in lots 16, 34, 40, 50, 51 and 137. Please park in designated rows (marked by the “Shovelin’ Bucky” signs). Top levels of ramps may be blocked off to better facilitate snow removal. 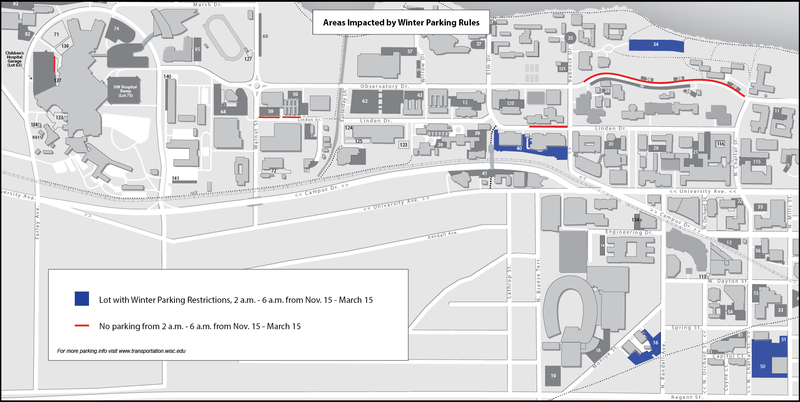 See the map below for specific lots affected by regular winter parking rules. Snow Action Days will be called by the university in the event of major winter weather. Review and adhere to all winter parking rules. Help keep the roads and parking lots clear. No parking is allowed on the top level of university ramps. Vehicles must be moved prior to 7 a.m. to avoid citation and relocation. Leave your cars, mopeds, and bicycles at home. Fewer vehicles on the roads mean less congested, safer travel for all. Dress for the weather. Wear warm clothes and shoes with excellent traction. The image below shows lots affected by winter parking rules. The map can be printed for easy sharing with second and third shift employees, students living in residence halls, or others likely to use these lots between the hours of 2 a.m. and 6 a.m. Click the image below to enlarge. Plan ahead and leave early. Winter conditions require everyone to travel slower than usual, and make delays more likely. Expect your fellow commuters on the road to encounter challenges, and be patient. Look out for each other. Always dress warmly enough that you would be okay if you were outside for an hour or more. Carry a cell phone in case of an emergency. If you don’t have a cell phone, tell someone where you’re going, and when you’ll be back. Be patient. Go slow, and be prepared for your fellow commuters to encounter troubles. Be predictable. Drive in a manner consistent with traffic laws, and obey signals, and take extra time to ensure intersections are clear before proceeding. Be defensive. Go slow. Expect the unexpected. Be aware. Keep distractions such as cell phones to a minimum. Be patient. Buses prioritize safety, and will only go as fast as conditions allow. Be informed. Sign up for text or email alerts so you know of major changes to service. Sign up available on the Madison Metro website. Be prepared. Use Metro’s Transit Tracker to find real time arrival information and reduce your outdoor waiting time. Be equipped. Wear proper clothing for the elements. Improve your traction on snow and ice with proper boots and/or traction devices. Be defensive. Have the numbers of local taxi companies with you in case your bus doesn’t arrive. Check out the bicycle commuting page for more tips. First and foremost, winter bicycling is extremely challenging, and only recommended for the experienced bicyclist. Please practice winter bicycling in a controlled environment before attempting to commute by bike. Be visible. Wear bright clothing and reflective lights or material. Be predictable. Ride in a manner consistent with traffic laws, and obey signals, and use designated bicycle lanes or paths whenever possible. Be defensive. Go slow. Always look for oncoming traffic, and make sure motorists see you. Be aware. Keep the volume on any portable devices low enough to hear traffic. Be predictable. Walk on sidewalks or pedestrian paths, cross at cross walks, and obey signals. Be defensive. Always look for oncoming traffic, make sure motorists and bicyclists see you. Be prepared. Wear proper clothing for the elements. If you’re walking a long distance, plan routes where you can go inside to warm up along the way, if needed. Be equipped. Improve your traction on snow and ice with proper boots and/or traction devices.